Thermometer TFX 422 is a precision verifiable compact thermometer, which is also waterproof and powered by an interchangeable lithium battery. It was designed for many applications in measurement and control in laboratories and industry. The electronics of the thermometer TFX 422 is controlled by a microprocessor. This ensures high measurement accuracy and linearity over the measurement range. The thermometer TFX 422 can be used as a verifiable official control thermometer to monitor the temperatures of frozen foods, according to the rules 92/2/EEC (with verification). 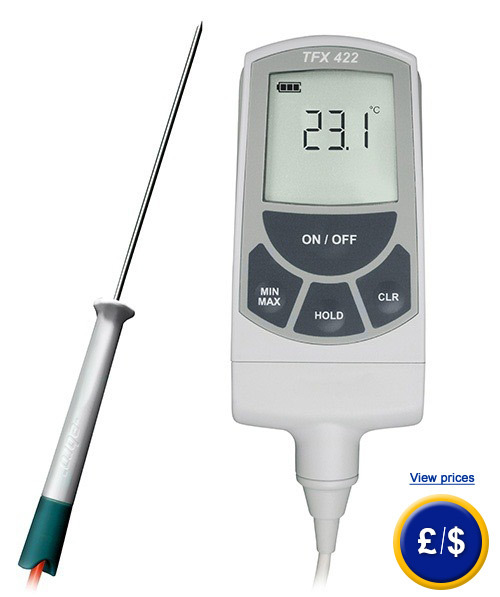 This verifiable thermometer TFX 422 has been tested and recommended by the German Association of Food Control. At the following link you will be able to find the digital thermometer most suiteable for your needs.